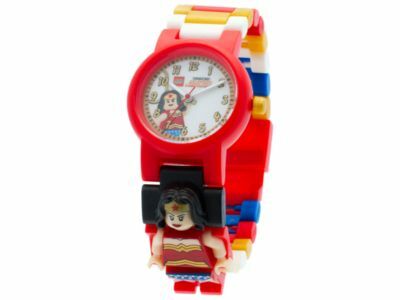 Show off your super-powers with this bright Wonder Woman Buildable Watch! Join the multicolored, interchangeable links—including one with a sculpted minifigure of Wonder Woman herself—to create a personal strap design that fits your wrist perfectly. The analog face features a picture of Wonder Woman so she’ll be right there with you whenever you check the time! Price is 44% below the initial Lego retail price, a € 11.12 discount! The Wonder Woman Buildable Watch (5004539) Lego set is available from the sites below. However, they do not offer delivery to your selected region. The Wonder Woman Buildable Watch (5004539) Lego set is no longer directly available from the sites below. However, 3rd party partners of these sites might still have the set available. Alternate description Watch the time with Wonder Woman! Create your own cool strap design! Makes a great gift for LEGO® fans and young super heroes!